Can I get home before dawn? 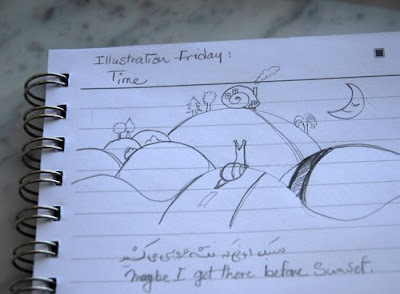 This week's Illustration Friday's topic is Time. You just leave me speechless! It's sooo romantic and sweet! Colors are perfect and smooth ... I really love the way you painted stars ,They look so real! well done! So enchanting! What a sweet scene with beautiful colors. It must be frustrating to be a snail. You can see your destination just taunting you in the distance for the longest time. This is so sweet and beautiful! I love it lots! Have a lovely merry day! lovely sketch!snail is so sweet and adorable! Darling piece. And beautifully rendered. So full of hope! Awww...this is really sweet! Love the use of colour. Rich and beautiful. Wonderful work. 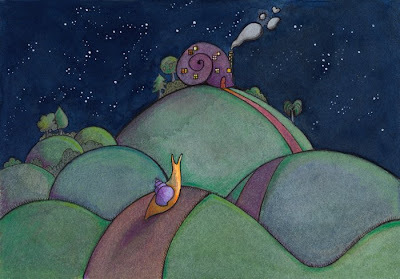 I love the rich colors, the sky with the stars and I just adore the snail house. oh! what a sweet illustration.. so smooth.. nice curves and colours.. I like it! That's so beautiful - the sentiment, the atmosphere, the colours, the little house with the lights on... I absolutely adore it, it's stunning!